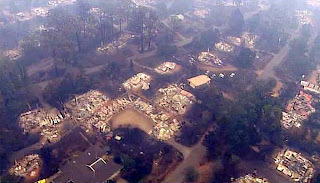 The town of Marysville in central Victoria has been almost completely destroyed by bushfires. Aerial pictures taken by the ABC show street after street of completely destroyed homes in the town. Most are just piles of rubble. Some still have walls standing and a handful appear to be mostly intact. Twenty-six people are now confirmed to have died in the fires north of Melbourne and this morning there are unconfirmed reports of bodies being found in cars overtaken by the fires in Gippsland in the state's east. Six of the dead have been found at Kinglake, six at Kinglake West and four at St Andrews and Wandong, all north of Melbourne. More bodies have been found at Humevale, Bendigo, and Arthurs Creek. Stuart Ord, of the Department of Environment and Sustainability (DSE) confirmed there have been substantial property losses in the Marysville area. Raylene Kincaide from Narbethong, south-west of Marysville, has lost her home and says the whole township is gone. "It's just devastating. We've lost everything. It's not good," she said. "Our little town had gone 20 minutes after we left. Probably 95 per cent of the houses are gone. She said they are worried that some residents are missing and have not been accounted for. "My partner was up there and he left when he saw the cattle burning. I've been in Ash Wednesday, but this is worse," she said.